SEATHWAITE, a chapelry and a mountain vale in Kirkby-Ireleth parish, Lancashire. The chapelry lies adjacent to Cumberland, 4¼ miles W by S of Coniston r.station. Post-town, Grisebeck, under Ulverstone. Acres, 10,940. Pop., 171. Houses, 34. The manor belongs to J. J. Rawlinson, Esq. The living is a p. curacy in the diocese of Carlisle. Value, £80. * Patron, J. J. Rawlinson, Esq. The church is good; and there is a parochial school. The vale is mainly identical with the chapelry; descends 4 miles south-westward, at an acute angle to the Duddon river; is flanked, on the right, by Greyfriars mountain, on the left, by the Old Man of Coniston and Dow Crag; and contains, in its central part, the lakelet of S. Tarn, gemmed with an islet, over-hung by precipices, and commanding a vista-view away to Fairfield mountain. 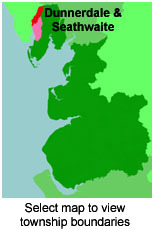 Local studies information is held at Cumbria Record Office & Local Studies Library, Barrow. Details about the census records, and indexes for Dunnerdale with Seathwaite. You can also perform a more selective search for churches in the Seathwaite area or see them printed on a map. The Register Office covering the Dunnerdale and Seathwaite area is Ulverston. Residents in 1882 found in Mannex's directory of Furness and Cartmel. Ask for a calculation of the distance from Dunnerdale & Seathwaite to another place. "DUNNERDALE, a township in the parish of Kirkby Ireleth, hundred of Lonsdale North of the Sands, in the county palatine of Lancaster, 3 miles N. of Broughton. Ulverston is its post town. It is situated on the river Duddon, and is united with the township of Seathwaite, forming one chapelry for ecclesiastical purposes. There is a small stone church at Seathwaite. The living is a perpetual curacy in the diocese of Carlisle, value £80, in the patronage of J. J. Rawlinson, Esq., of Duddon Hall, who is lord of the manor. There is a parochial school for both sexes." "SEATHWAITE, a hamlet and chapelry in the parish of Kirkby-Ireleth, hundred of Lonsdale North of the Sands, county Lancaster, 7 miles S.W. of Hawkshead, and 17 N.W. of Ulverston. It is situated in the vale of Dudden under the Old Man and other fells. The chapelry includes Seathwaite Tarn. The land is chiefly pasture, with some arable and meadow. The living is a perpetual curacy in the diocese of Carlisle, value £108." In 1835 Seathwaite was a chapelry and Dunnerdale a township in the parish of Kirkby Ireleth. You can see the administrative areas in which Dunnerdale & Seathwaite has been placed at times in the past. Select one to see a link to a map of that particular area. The history of Dunnerdale and Seathwaite as described in Mannex's directory of Furness and Cartmel, 1882. View maps of Seathwaite and places within its boundaries. For probate purposes prior to 1858, Seathwaite was in the peculiar of the Dean of the Chapter of York whose records are deposited at the Borthwick Institute. A list of the probate records at York which relate specifically to the ancient parish of Kirkby Ireleth (including Broughton-in-Furness and Seathwaite) is available at Cumbria Record Office, Barrow.